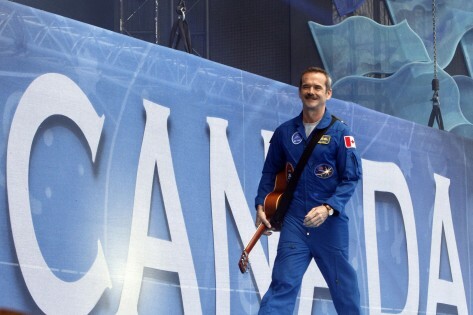 Chris Hadfield is just plain cool. Last week I had the pleasure of seeing Commander Hadfield, Canada’s most earthy space ambassador and author of An Astronaut’s Guide to Life on Earth. His presentation resembled a TED talk, it was both inspiring and motivating, and wait for it—out of this world. The thing that struck me the most is that he started dreaming what he describes as an “impossible dream” from the age of nine. Canada did not have a space program at the time, yet, he was determined to become an Astronaut. This meant preparing very early, advancing his education, learning to fly, learning to speak several languages, and learning to play guitar (now a terrestrial superstar by crooning David Bowie’s Space Oddity). He did these things and showed us ordinary earthlings that dreams do matter, even if only a slim possibility of manifestation, it can and will happen with dedication, preparation and patience. There are days when I think finishing my current novel is an impossible dream. But I’m half-way there, I’m resuming momentum and receiving encouragement from my fellow Restless Writers. I can do this! And I will, because I am the commander of my writing career. I am dedicated, prepared, and ever so patient in the wonderful world of literary longings. My dream of becoming a novelist is too important to remain unlived. Sure, the odds are stacked against me. But I’m still going for it! Thanks to extraordinary people like Chris Hadfield, who not only make us proud to be Canadian but who also show us how to make the impossible a reality.